I've already mentioned Naj-Oleari before, a brand that never made it in the States, but that was the biggest thing back in the 80s, in Italy. And guess who lived in Italy back in the 80s? Yes, yours truly. And like every teenager girl back then, I had a passion for Naj-Oleari. But the 90s came, and when those teenagers grew up, Naj-Oleari started to fade. The only products they sold were make-up and perfumes, and it got harder and harder to find anything else. Now every time I go back to Italy, I always look for something Naj-Oleari, and the time before last I was very lucky and found a light blue denim handbag with pink fleece lining. The cutest thing! Unfortunately, on my last visit, the lady at a school supplies store looked at me as if I had three heads when I asked for Naj-Oleari. "They don't make that anymore" she said to me. "I know" I replied "I was just hoping for some leftovers". "I remember Naj-Oleari! All the girls were wearing it" and he smiled at me. He was about my age, and for a minute we shared a similar feeling, a nostalgic one for those good old days. 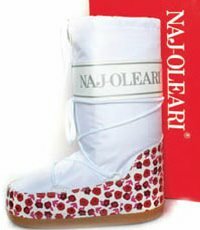 So imagine my joy when I read that Naj-Oleari is coming back with a shoe collection! I understand their patterns are quite childish, but I can't help feeling excited. 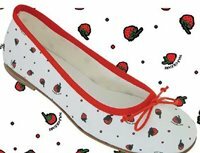 My inner child is screaming for these adorable shoes. And I love the boots! I think I'm allowed to take off the heels for a day and be a little girl again. Oh my goodnees, those shoes are adorable! When I read your comment I thought it was me writing. I grew up in Italy and I was a big fan of Naj Oleari especially the school stuff such as bags, pencils, notebooks etc.. And Like you everytime I go back to Italy I am always in serach of anything that it's from N.O. I managed to find a school bag in this cartoleria and it was all dusted and I fell in love and bought it. I have been in contact with the company and they have told me that soon they will have school material again. I can't wait. I wish they would make it to the States. You are right the only thing I can find here is the parfeume which is actually my fav. I am so happy I found someone like me!!!!!!! Nice to meet you!!!! very nice to meet you too! I'm happy to see I am not the only one left wanting more of this brand. Where was the cartoleria, in which city? I would have done the same thing too. I just came back from my trip to Milan. It was my first time there. I bought a Naj-Oleari bag from a little bag store in the city. I paid for $53 euros for this lovely bag - it is made of black and white silky materials on the outside and has very pretty and modern patterns. I am just googling this brand and found your post - I am glad that it is a special brand!! I'm going to be listing a Naj Oleari vinyl briefcase with a little floral pattern, on Ebay starting Monday the 17th, if you want to keep your eyes open for it - just to see the pictures, anyway, whether you ever bid or not. Please let me know when you put the bag on Ebay. What's your user name on Ebay? Thanx!